No ! I didn’t misspell the title of this blog. I’m not sure about you but since my childhood (not trying to give away my age), I’ve always been a keen James Bond fan – slight inspiration for my website and blog name. I’m now in the process of trying to keep up with technology and buy my favourite James Bond films on DVD. So the other night, I finally sat down to watch the DVD re-mastered version of one of my all time favourites – From Russia With Love, starring Sean Connery as James Bond. I noticed that of all the James Bond films I can remember, this is the only one where James Bond actually ordered a cup of coffee and not his usual shaken not stirred cocktail. 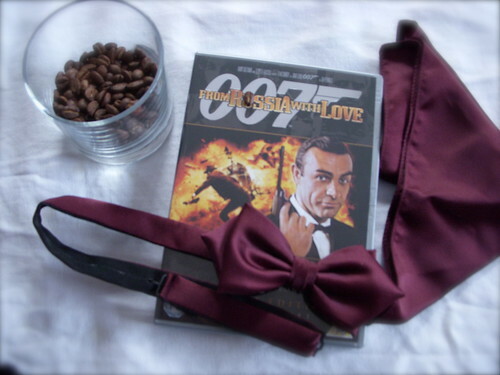 Perhaps, the author, Ian Fleming, thought that for that scene in Turkey – home of the first coffee culture phenomenon – James Bond should order coffee and not an alcoholic drink. I also found out that Ian Fleming had a house in Jamaica, where he wrote some of his novels and that one of his favourite drinks was coffee, the highly renowned and most expensive coffee, Jamaica Blue Mountain coffee naturally, which incidentally is supposed to be James Bond’s favourite coffee bean. What a coincidence – just thought that I’d share. This entry was posted on Tuesday, April 1st, 2008 at 10:13 am	and posted in Thoughts. You can follow any responses to this entry through the RSS 2.0 feed.